In my last post I showed how to send a Simple Notification Service (SNS) message to an email endpoint. Now I show how to easily add a WebHook endpoint. WebHooks are a design pattern using an HTTP POST to send a notification to a URL which the “subscriber” has registered with the service. WebHooks are being used in an increasing number of web APIs and there is an interesting interview with Jeff Lindsay on this topic at IT Conversations. A useful test platform for WebHooks is PostBin.org. Simply click on the “Make a PostBin” button and you will be presented with a new URL for your notification messages – something like “http://www.postbin.org/1hf0jlo“. This is the URL you register with SNS. Turning to the SNS dashboard, add a new subscription to a topic that you’ve already configured in SNS. Specify protocol “HTTP” and enter the PostBin URL as the endpoint. SNS will post a confirmation message to this URL before you can send through messages. Go back to your PostBin URL and you should see the confirmation message. Buried in the message is the SubscribeURL which you need to hit in order to confirm the subscription. I pasted it into notepad and edited “cleaned up” the URL before pasting it into a browser. This confirms the subscription with SNS. AWS is the latest to the join the cloud pub/sub hubbub with the (beta) launch of its Simple Notification Service. I took it for a spin this morning while waiting for my flight. Once I signed up for the service in my AWS account, it was a simple matter of opening up the AWS Console and selecting the SNS tab. You create a topic (I called mine “MyPersonalTweeter”). Subscribers can be HTTP/HTTPS WebHooks, or an email address or an SQS queue. I selected email. AWS sends a confirmation to the nominated email address (damn, there go the SPAM opportunities). Then just publish a message to the topic consisting of a subject and a message body (for some reason my first message never arrived, so I’m showing message number two sent later that day). 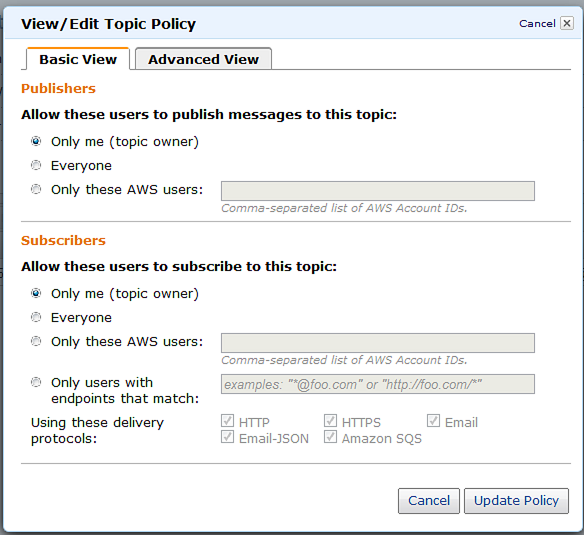 Digging a bit deeper, topics have policies which allow reasonably fine-grained control over who can publish and subscribe to your topic. Everyone agrees that 2008 was the year that Cloud Computing Hype took off, but here is the “proof” that it was sometime around October 27 2008. The two graphs show the Google Insights data for search terms related to “cloud computing”, “azure”, “ec2” and “google cloud”. The lower diagram shows the search popularity for each term normalised to a range of 0 to 100. 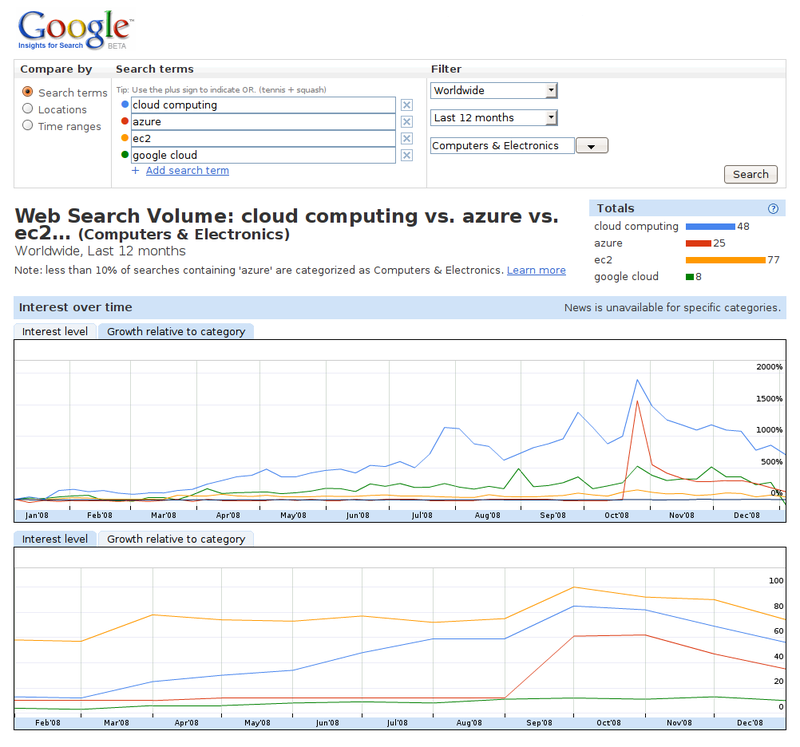 The upper diagram shows the rate of change of these search terms with respect to the overall category of “Computers and Electronics”. In absolute terms “ec2” had the lions share of search popularity reflecting perhaps its more mature status. “Azure” didn’t appear until September – leading up to its launch on October 27th. To represent Google I had to use a compound term such as “Google Cloud” because “Google” by itself simply swamps the search results and would skew it to unrealistic levels, so it is likely that the Google representation in these “cloud searches” is lower than reality. Using a different term such as “Google App Engine” doesn’t change the conclusions. The interesting part is the growth in search interest. “Cloud Computing” shows very strong and steady growth throughout the year, peaking around October 27. This is the rate at which search interest was growing, so although search interest will continue to grow in the future, it may never grow as fast as it was in October 2008. Azure may be a late player in the field, but it seems to have sparked a lot of general interest.